The Internet's latest viral wizard matches smart technology and lily-white earnestness to market "stuff that matters" online, and the Gates Foundation is buying. The first blockbuster hit came from an unlikely source: Irish talk radio. In 2010, Michael D. Higgins, then a foreign-policy spokesperson for Ireland (and now its president), went on the radio in Galway and excoriated a conservative American talk show host for opposing President Obama's plan to enact universal health care. For a long time, the audio file of the berating lingered in Internet purgatory. Then, in August 2012, Mansur Gidfar uploaded the audio to the new, rapidly growing site Upworthy.com in August 2012. He tried the headline, "A Tea Partier Decided To Pick A Fight With A Foreign President. It Didn't Go So Well." The article went certifiably berserk, eventually becoming the site's first million-hit story. Today, Upworthy is a million-hit machine for heartfelt, progressive content, and it is trying to use this alchemy—spinning hearty fiber into viral gold—on behalf of the Bill and Melinda Gates Foundation. On Tuesday, the company announced it is launching a global health and poverty section backed with Gates money, suggesting a future for not only the site's editorial strategy but also for its business. Upworthy has mastered the dark viral arts with a unique blend of A/B technology and lily-white earnestness. The staff scours the Web for "stuff that matters," writes multiple headlines for a test audience, selects the top-performer, and blasts it out on social media. It's a deceptively simple plan that's devouring the Internet, one Facebook Newsfeed at a time. The site nearly surpassed 50 million unique visitors in October, which suggests traffic comparable to giants like Time.com, and Fox News. Upworthy has run paid content, like a Microsoft-sponsored video of a Ugandan man talking to his family over Skype. But this is the first time that an organization like the Gates Foundation has paid to popularize a particular concept like global health and poverty. In a way, the partnership harkens back to Upworthy's founding idea to be a bullhorn for non-profits, amplifying their research and message, and then taking a cut. This pilot partnership will provide one full-time "curator" to trawl the Web for stories about toilets (Everyone Poops, But 2.6 Billion People Do It In A Really Crappy Way) and global disease (When Future Generations Look Back On Us, They'll Say We Had The Opportunity To End 3 Awful Epidemics). "We've always wanted to draw attention to the most important issues," co-founder and CEO Eli Pariser told me. "The health and poverty of the lower third of the world's population is one of the least covered issues of our time. There are people who put incredible effort and creativity into making a YouTube video on malaria, and it just gets 5,000 views. We're hoping to go out and find those things and bring them to a much wider audience." Upworthy's vertiginous success isn't without criticism. The site's pleading, occasionally histrionic, gooeyness has inspired criticisms of so-called "glurge" and a popular parody account, @UpWorthIt. 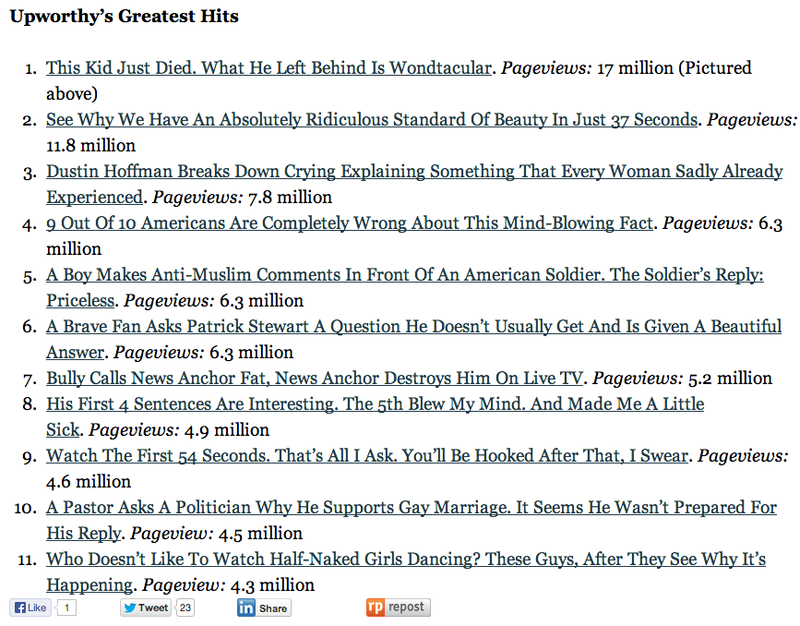 Here, for example, is a list of Upworthy's 11 greatest hits, whose pageviews are downright otherworldly. There is an amygdala-tickling genius here, but also a kind of movie-trailer mawkishness. What's the "secret"? An entertaining slideshow of Upworthy's headline-writing strategies last year repeatedly references the "curiosity gap." The idea is both to share just enough that readers know what they're clicking and to withhold just enough to compel the click. Upworthy rankles some journalists partly because, even as it innocently coos Web readers with tender headlines, the repetitiveness of its style suggests a rather cynical ploy to lasso cheap attention rather than fully engage an audience hunting anything more than a dopamine rush. But Pariser has heard these critiques and has a ready rebuttal: What special virtue is there in letting great videos, articles, and images fall into the Internet's abyss simply because nobody thought of the right combination of words to unlock its audience? What's more, when readers find themselves hating a headline picked by a testing audience and shared by 10 million people, whose tastes are we really objecting to—Upworthy's or ours? Pariser, who honed his data-driven chops at MoveOn.org, said the media's obsession with Upworthy headlines misses half the story. "Some of the stories about us have focused too much on the headlines, but to have content that's really shareable, it has to be something people actually want to share," he said. "We look at how much people click, but also how much people share [after they click]. The only way to get something that does really well is to deliver on the quality that you're promising in the headline." As for his critics, Pariser said that a handful of journalists with Twitter bullhorns shouldn't get to out-vote 50 million (and growing) monthly unique visitors. "I'm not going to pay too much attention to some snarky New Yorkers who see [our headlines] too many times in their feed," he said. "Part of the ambition is to build something that isn't a niche product. And for folks building great content that is more for a specific NYC elite audience, the sensibility is not going to mesh." The Gates Foundation's sponsorship has already inspired posts that will feel familiar to both Upworthy's fans and skeptics. Marketing a video by Water Is Life to promote the accessibility to drinking water, you have the supplicating headline: "The Things This 4-Year-Old Is Doing Are Cute. The Reason He's Doing Them Is Heartbreaking." It is classic Upworthy. Unapologetic, sentimental, cliff-hangery as heck, and two sentences long. And video itself? Pretty touching, really. I can't say I regret the click.